"The Fourth Dimension is a Many Splattered Thing!" 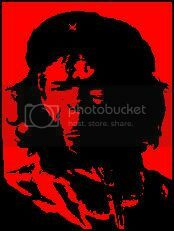 The idea is that you choose the artist that you would most like to have do your portrait. This can be very telling on a personal basis, as your choice not only reflects which artist that you happen to like, but also reveals details about how you would like to be portrayed. Leave a comment on her blog about which artist you would choose to portray you! I decided on comic book artist Jack Kirby, because although Steve Romita draws the best Gwen Stacy and Mary-Jane Watson (and the best Aunt May, for that matter), there can be now doubt that Jack Kirby pens the most awesome super villains of all time. 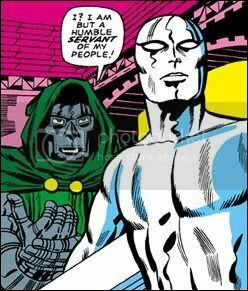 Nobody can portray Dr. Doom, Galactus or the Silver Surfer better than Jack Kirby. 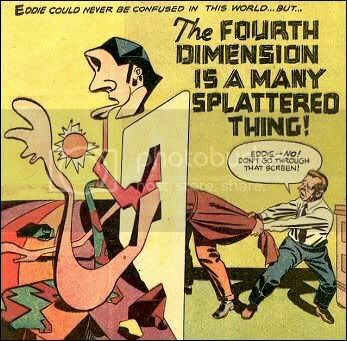 I was looking for a link to an image of one of Kirby's incredible Dr. Doom panels when I came across an early Kirby story, "The Fourth Dimension is a Many Splattered Thing!" (Via Cartoon Snap.) This story is amazing! He has certainly taken the idea of interdimensional dating to a new level. I choose Bill Sienkiewicz to do mine. 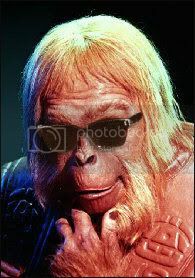 Dr. Zaius's choice was truly inspired, even surreal. And I was even able to pair it with a vote for the brilliant Czech caricaturist Adolf Hoffmeister! I would like than John Cassaday do mine; he´s alive and I do really like his job in "Planetary". I've always been partial to Edward Hopper myself. I suppose it's because of his use of color and shading gives his paintings such a vibrant, pure quality. Some links to the artists would be appreciated by the overworked curator here. (I do have plenty of Hopper on hand.) I guess I'll do a special post on the preferences of the readers here since they are a unique breed. I'll now head out to have my portrait painted. nothing so high and mighty for me--the person who does the Cathy cartoon strip would suit me fine I do believe. Cool link, Dr! Thanks! In return, I'm coughing the Splotchy story virus onto your tender and exposed mucus membranes. 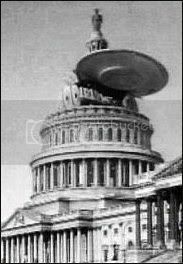 Check my impeachment bloggy for details. Dr. Monkey Von Monkerstein: Good choice! But you should write a little paragaph about why this is the artist to best portray you, and put it in the comments over at Karla's blog! Karla: Jack Kirby and Adolf Hoffmeister - I think that this pairing will be a first! Odile: Another comic book artist! Great minds think alike! But you should write a little paragaph about why this is the artist to best portray you, and put it in the comments over at Karla's blog! chaos4700: I have never thought of Edward Hopper as a artist that did portraits, but I have always liked his work. He creates such a great atmosphere in the mood of his paintings. you should write a little paragaph about why this is the artist to best portray you, and put it in the comments over at Karla's blog! Oh, and screw Lieberman. I'll be damned if I am going to waste Jack Kirby's talents on that little turd polisher! Karla: I know. I don't know what to tell you. They were supposed to go over to your blog and leave comments! Liberality: Ack! Another cartoonist! Geat choice. I have always loved that strip. But you should write a little paragaph about why this is the artist to best portray you, and put it in the comments over at Karla's blog! dguzman: Ack! I'll get right to work on it! I am keeping a close eye on this space.